Preheat oven to 225 degrees. Line 2 large baking sheets with foil (I think parchment paper works alright too). Using an electric mixer, beat egg whites, salt and cream of tarter to soft peaks. Add the sugar and continue to beat until the whites form stiff peaks. Stiff peaks are when you take the beaters out and the mixture doesn't settle back down again but rather holds its shape. Using a spatula, transfer the mixture into a large ziploc style bag. Press out as much air as possible and seal the bag. Now cut off just a little bit of one lower (non zipper) corner of the bag. Carefully squeeze out some of the mixture in small swirls (think Dairy Queen soft serve) on the prepared baking sheets. They shouldn't spread out at all and will not expand when baking so feel free to put them relatively close together. Sprinkle the tops with the crushed candy canes. Bake for 1.5 hours. They should be completely dry on the inside when they're done. The only way I've found to test this is to eat one - it's a tough job but you'll have to take one for the team. Once they're done, turn off the oven and allow them to cool in the oven with the door propped a bit open. When they're completely cooled, you should be able to pop them right off the foil with your fingers. Store covered in a cool dry place for up to 2 months. A fancy addition to this that I did last year was to then dip half of each one in melted milk chocolate chips. 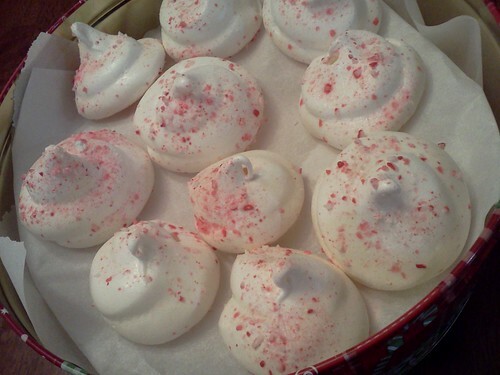 I found it was a bit easier to melt the chocolate using the double boiler method on the stove rather than the microwave because then the chocolate remained nice and melty as I worked through a rather large batch of meringues. I allowed the chocolate covered versions to cool on a parchment paper covered cookie sheet in the refrigerator. These look amazing. I am going to add it to my baking list for tomorrow. How many does a batch make? Thanks! I"m a new follower!